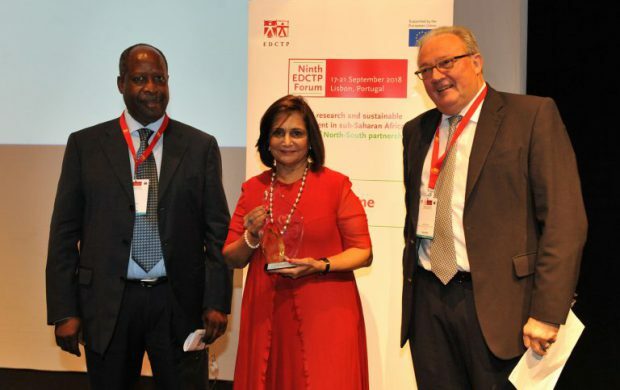 EDCTP awarded its prizes for research excellence and the Pascoal Mocumbi Prize at the opening ceremony of the Ninth Forum on Monday 17 September. The prizes went to award winners well-established and well-known in the international and African research community. Dr Leonardo Simão and Prof. Marcel Tanner, the EDCTP High Representatives for Africa and Europe, presented the prizes in an informal ceremony. The Pascoal Mocumbi Prize was awarded to Professor Souleymane Mboup. Prof. Mboup is a pioneer in HIV research in Africa. His career spans more than 35 years and has been dedicated to HIV-related research and lecturing at the Cheikh Anta Diop University of Dakar and partner universities across the world. He and a research team discovered the HIV-2 virus. Professor Mboup has contributed immensely to our present understanding of the diagnosis, transmission, natural history and pathogenesis of HIV. He represented Africa on the International AIDS Society’s Governing Council and served in leadership roles including team leader of the Senegalese AIDS Care Team at Harvard’s AIDS Institute Enhancing Care Initiative, and as the Senegalese coordinator for the Inter-University Convention (Harvard-Dakar-Tours-Limonges) for Research on Human Viruses and Related Diseases. He initiated the construction of a state-of-the-art facility, Institut de Recherche en Santé, de Surveillance Epidémiologique et de Formations (IRESSEF) that was officially launched by His Excellency Macky Sall, President of Senegal in June 2017. His vision is to build IRESSEF into a modern platform for the promotion of high-quality research and training in Africa. Prof Mboup has authored more than 250 publications and 20 books including co-authoring the monumental and comprehensive AIDS in Africa. Moreover, he has been the coordinator of the EDCTP Regional Network of Excellence for West Africa (WANETAM) since its inception. He will be co-chairing the African Society for Laboratory Medicine 2018 conference to be held in Abuja, Nigeria in December 2018. 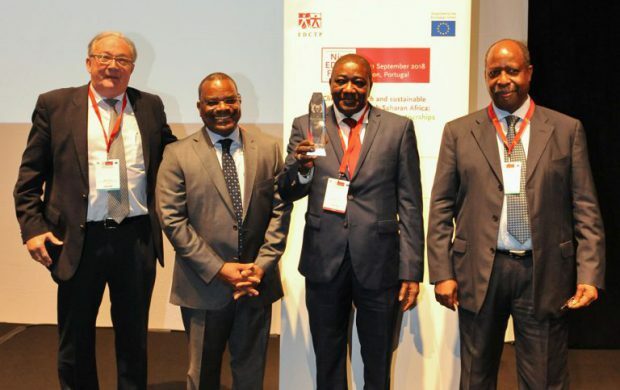 The prize is named after EDCTP’s first High Representative and former Prime Minister of Mozambique, Dr Pascoal Mocumbi, in special recognition of his outstanding contribution to fostering global partnerships in health research and his support for capacity strengthening in Africa. It is to be awarded to a senior scientist, or policy-maker or advocate for health and research from anywhere in the world. The prize of €50,000 serves to raise general awareness of the specific achievements of the award winner and the EDCTP2 programme. The Outstanding Research Team prize was awarded to the CHAPAS studies team (Children with HIV in Africa – Pharmacokinetics and Acceptability of Simple antiretroviral regimens), a large research group that accomplished over more than a decade several crucial HIV paediatric and adolescent treatment trials. The prize was received by the team’s leader Professor Dianna Gibb (Programme leader of the Paediatric programme of trials and cohorts at the MRC Clinical Trials Unit, United Kingdom). She was accompanied by other CHAPAS team members present at the forum, including Dr Mutsa Bwakura-Dangarembizi (University of Zimbabwe, College of Health Sciences, Harare, Zimbabwe), Prof. David Burger (Professor of Clinical Pharmacology, Radboud University, Nijmegen, The Netherlands), and Dr Cissy Kityo Mutuluuza (Executive Director of the Joint Clinical Research Centre, Kampala, Uganda). During the opening session of the Forum, immediately before the prize ceremony, Dr Kityo delivered a presentation on the impressive achievements of the CHAPAS trials. 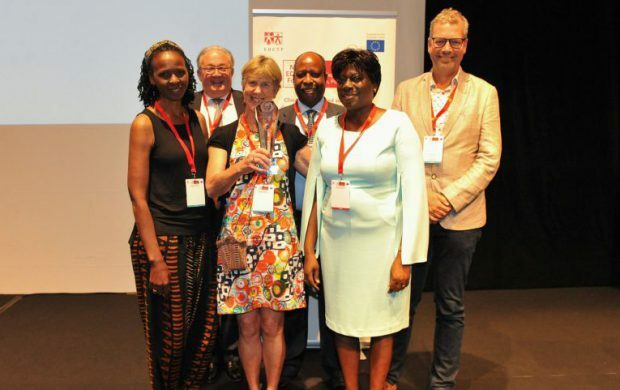 The prize is awarded to an outstanding research team from Africa and Europe working on HIV/AIDS, tuberculosis, malaria and neglected infectious diseases in the scope of the EDCTP2 programme. The prize of €50,000 should be used to further the research programme of the award-winning team and may support activities such as supporting study visits and training attachments to collaborating institutions, data collection for baseline studies, conference and meeting attendance, and other relevant research-related activities. Prof. Ramjee obtained her science degree at the University of Sunderland in the United Kingdom and her Masters and PhD through the Department of Paediatrics at the University of KwaZulu-Natal in Durban. She has extensive experience in HIV prevention methods for women and investigated women-initiated HIV prevention options since many years. She also conducted large-scale trials of antiretroviral-based oral and topical prophylaxis. Her excellence in clinical research and capacity building brought her the Life Time achievement award in HIV prevention by a panel of international peers. She was also a recipient of the South African MRC Gold award given for scientific excellence. The prize of €20,000 should be used to further the research programme of the awardee and may support activities towards training and mentorship of the future generation of researchers in Africa. 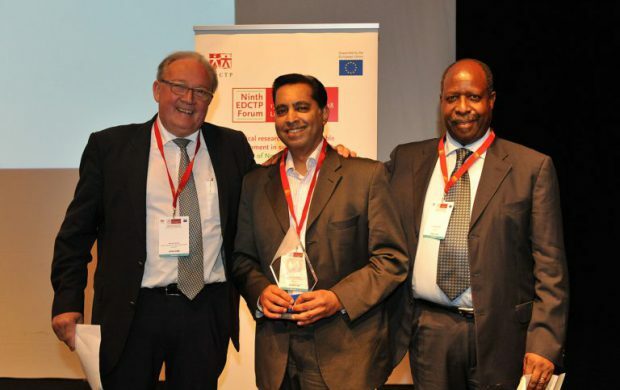 Professor Keertan Dheda (Head of the Centre for Lung Infection and Immunity and Head of the Division of Pulmonology at Groote Schuur Hospital and the University of Cape Town, South Africa) received the Scientific Leadership prize. His research work has focused on the epidemiology, diagnosis, and transmission of tuberculosis. He has published over 220 peer-reviewed papers (Scopus H index= 55) including 4 first or senior author original publications in The Lancet. He has been the recipient of several prestigious awards including the International Union Against Tuberculosis and Lung Disease Scientific Award. This prize of €10,000 is awarded to an excellent scientist in Africa working on HIV/AIDS, tuberculosis, malaria and neglected infectious diseases (NIDs) within the scope of the EDCTP2 programme. The prize should be used to further research-related activities.